The Drop is a 2014 American crime film directed by Michaël R. Roskam, from a screenplay written by Dennis Lehane. The film is based on Lehane's 2009 short story "Animal Rescue". 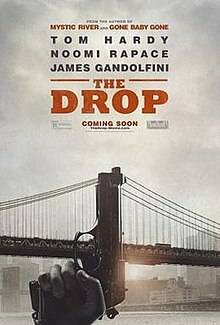 Lehane also adapted the script into a 2014 novel of The Drop. The film stars Tom Hardy, Noomi Rapace and James Gandolfini (in his final film role), with Matthias Schoenaerts, John Ortiz and James Frecheville in supporting roles. It was screened in the Special Presentations section of the 2014 Toronto International Film Festival, and was released theatrically on September 12, 2014. Bob Saginowsky (Tom Hardy) is a bartender at a neighborhood bar in Brooklyn. Marvin Stipler (James Gandolfini) ceded ownership of the bar years earlier to Chechen mobsters and now operates it with Bob as a 'drop' for illegal takings. Marv ridicules Bob and some patrons for commemorating the 10th anniversary of the murder of a man named Richie Whelan. On his way home, Bob finds a battered pit bull pup abandoned in a household garbage can. While rescuing it, he meets Nadia (Noomi Rapace), a resident of the house. Bob leaves the dog in her care until he can decide whether to adopt him. When the bar is robbed by two masked gunmen, Marv is annoyed that Bob told investigating Detective Torres (John Ortiz) about one of the gunmen wearing a broken watch. Chechen thug Chovka (Michael Aronov) later tells Marv and Bob that they must make up for the stolen money. Marv later meets with one of the perpetrators, Fitz (James Frecheville), revealing that he orchestrated the robbery. A later discussion between Marv and his sister, Dottie (Ann Dowd), reveals Marv’s motive is to continue payments for his father’s life support. Bob decides to keep the dog and names him Rocco, all the while bonding with Nadia, who agrees to care for the dog whenever Bob tends to the bar. Nadia has scars on her neck that she reveals are self-inflicted from when she used to have a drug problem. While walking Rocco in a park, a passerby, Eric Deeds (Matthias Schoenaerts), approaches Bob and comments about Rocco. Deeds later appears at Bob's house and provides proof that he is the actual owner and admits to beating and abandoning him. He demands Rocco be returned before he raises the matter with the police. Later, Bob and Marv find a bag at the bar, containing a severed arm with a broken watch together with the stolen money. Bob is unnerved when Deeds appears in the bar and reveals he is friends with Nadia. Marv informs Bob that Deeds is a dangerous thug who claims to have killed Richie Whelan. When Bob confronts Nadia, she admits that she and Deeds used to date. Bob and Marv return the money to the Chechens, who in turn inform them that the bar will be the drop site for the night of the Super Bowl. Marv meets with and kills Fitz, and then recruits Deeds to rob the bar the night of the Super Bowl. Bob is later confronted by Deeds, who demands $10,000 lest he take Rocco, starve him, and then beat him again. When Marv informs Bob that he will be calling in sick on the day of the Super Bowl, Bob becomes suspicious and warns him to not do something desperate "that we can't clean up this time". On Super Bowl night, with Rocco in tow, Bob takes $10,000 hidden in his basement and hides it behind the bar counter, with a pistol. Deeds breaks into Nadia's home and forces her to go to the bar with him to watch the Super Bowl. Elsewhere, Marv lines his car trunk with plastic before parking and waiting near the bar, watching various mobsters drop off money throughout the night. Eventually the bar clears except for Deeds and Nadia. Deeds refuses Bob's offer of $10,000 for Rocco, then threatens to kill Nadia if he does not open the time lock safe during the window available at 2 a.m. While they wait, Bob tells a story about Marv when he was a loan shark and how he used to skim off the Chechens. Bob once killed a customer who had hit a huge casino jackpot, using the money to replace Marv's thefts from the Chechens, and Bob disposed of the body in his heating oil tank with lye and laundry detergent. He reveals to Deeds and Nadia that the victim was Richie Whelan, whom Deeds has always taken credit for killing. Bob then draws his gun and shoots Deeds at point-blank range. When a terrified Nadia asks if she can leave, Bob explains that although things go on all around him, he is not a part of it. The Chechens dispose of Deeds' body and collect the money from the drop. Chovka informs Bob he was aware of Marv's deceit, as Marv is killed in his car while waiting near the bar. Chovka accepts that Bob played no part in the robbery and provides him ownership of the bar as a reward. Det. Torres visits Bob at the bar to offer condolences over Marv's death, which Bob attributes to a carjacking gone wrong, while Torres believes it to be an execution. Torres asks Bob if he has seen Deeds as he has been reported missing and was last seen at the bar, just as Whelan had been years earlier. Torres tells Bob of the tie between Deeds and Whelan in that Deeds always took credit for Whelan's death, but was in a psychiatric ward the night Whelan went missing. Torres then insinuates that Bob is responsible for both Deeds' and Whelan's disappearance by saying "No one ever sees you coming, do they, Bob?" Later, Bob visits Nadia and asks her if she wants to see him again. Nadia offers to take a walk with him and Rocco and goes to get her coat, while Bob waits outside. The Drop opened in 809 theaters in North America and grossed $4,104,552, with an average of $5,074 per theater and ranking #6 at the box office. The film's widest release in the United States was 1,192 theaters and it ultimately earned $10,724,389 domestically and $7,933,992 internationally for a total of $18,658,381, above its budget of $12.6 million. The Drop received positive reviews from critics and has a "certified fresh" score of 89% on Rotten Tomatoes based on 190 reviews with an average score of 7.1/10. The critical consensus states "There's no shortage of similarly themed crime dramas, but The Drop rises above the pack with a smartly written script and strong cast." The film also has a score of 69 out of 100 on Metacritic based on 36 critics indicating "generally favorable reviews". Particular praise was given to the performances of Tom Hardy and James Gandolfini. ^ "Marco Beltrami Takes Over Scoring Duties on Michael R. Roskam's The Drop". March 8, 2014. ^ "The Drop (2014)". IMDb. Amazon.com. Retrieved February 11, 2015. ^ "Box Office: Guardians $300M+; No Good Deed No. 1; Dolphin No. 2". Deadline.com. September 15, 2014. Retrieved October 2, 2014. ^ a b "The Drop (2014)". Box Office Mojo. IMDb. September 12, 2014. Retrieved November 20, 2014. ^ "Toronto Film Festival Lineup". Variety.com. Retrieved July 22, 2014. ^ "The Drop (2014)". Rotten Tomatoes. Flixter. September 12, 2014. Retrieved October 30, 2014. ^ "The Drop (2014)". Metacritic. CBS Interactive. Retrieved October 2, 2014. ^ "Movie review: The Drop goes deep in a rough part of town". The Salt Lake Tribune. Archived from the original on October 6, 2014. Retrieved October 2, 2014. ^ "In The Drop, Dennis Lehane goes to Brooklyn". BostonGlobe.com. Retrieved October 2, 2014. This page was last edited on 18 November 2018, at 08:36 (UTC).